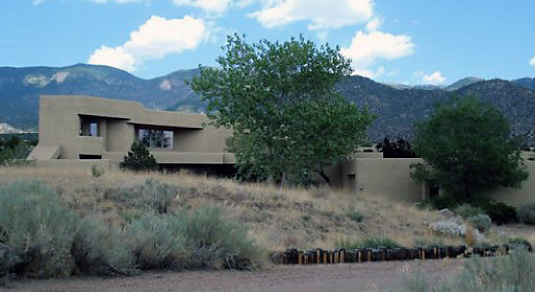 With a most dramatic location directly adjoining the Sandia Mountain National Forest to the east the owners hoped for intimate contact with earth and sky, surrounded by native flora and fauna . Site Solution: The house is nestled into the ground, native plants cover a foreground hill and hide the entry courtyard. 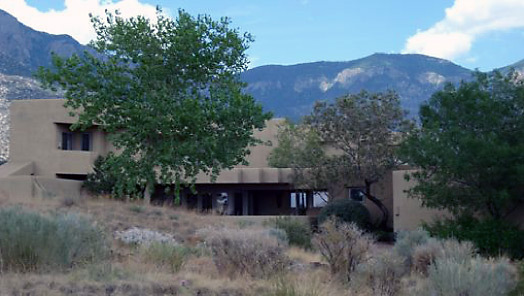 As you approach, the lower floor is hidden but the Mountains are visible. Hill and native trees shade the house and temper the strong western sun. Garages are separately articulated and used to define an entry courtyard. Overhangs and Trees provide intimacy and coolness. The desire was for the House to have the strongest integration with Site and Natural Setting, living the place" and the drama of the daily cycle of nature: On the edge of the City and yet fully removed . House Architecture: A two-story solution saves an envelope of natural terrain around the dwelling and creates interior spaces equal to the stunning vertical mountain panorama. 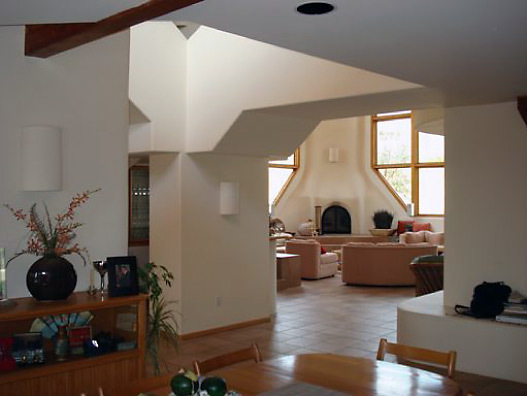 A tall masonry fireplace anchors the view in the living room, shared with an adjoining triangular media room. Stairs bridge to bedroom suites above . A breakfast room overlooks the mountains and the yard. Kitchen, Dining and Entry Areas survey the naturalistic entry drive and courtyard with view of City evening lights to the southwest. 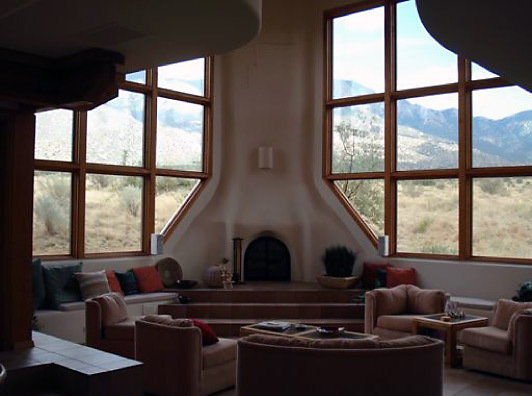 Solar Design: Glazing is placed for views and passive solar gain, minimizing northern and western exposures. 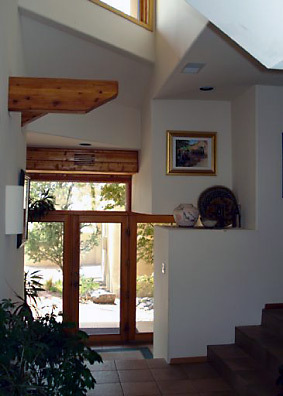 Deciduous trees and deep overhangs are used strategically. 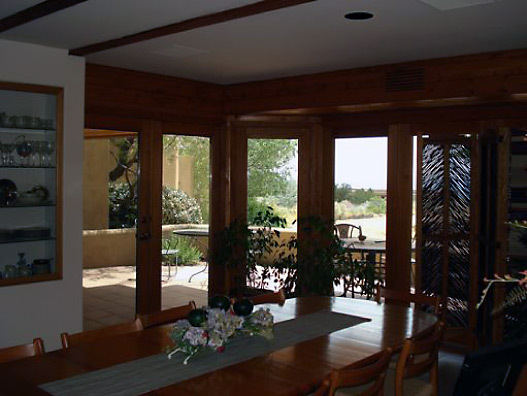 Energy Conservation/HVAC: LowE glazing is used for all windows and glass doors. Whole house fans exhaust from return plenums to contribute summer night time cooling. Efficient natural gas radiant floor heating extends throughout the house. A separate water heater serves guest rooms. Deep roof cavities allow good insulation. Ecology: Natural washes are gently re-routed and provide special interest. 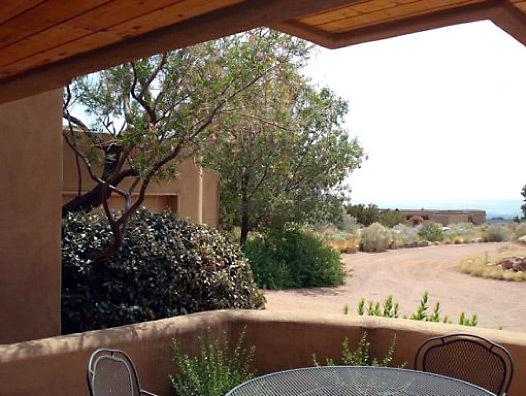 Dry-ecology native plants are used almost exclusively and those within the house footprint were saved for later landscaping of disturbed areas and a sheltering hill to the west. Non-natives are limited to a small sunken yard. Driving surfaces are porous .